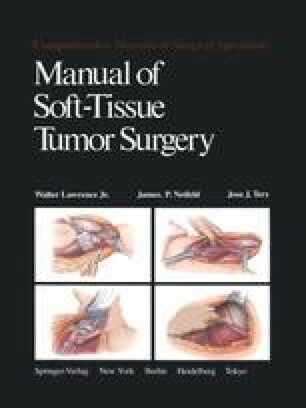 The surgical management of soft-tissue sarcoma is not infrequently associated with various degrees of physical disability, which may range from limitation in range of motion to loss of an extremity. The loss of function may result in discomfort from prolonged sitting, standing, and walking, difficulty in running or kneeling, precarious balance, restrictions in lifting, and inability to hold or grasp objects. The fear of the anticipated disability from treatment produces significant anxiety in the patient and his family, with major concerns of dependence, pain, alteration of self-image, loss of self-esteem, and psychosexual adjustment problems. A well-planned program for rehabilitation will minimize the psychosocial and functional impact of any loss of function from treatment by restoring the patient to self-sufficiency at his highest attainable skill in the shortest period of time. These goals are attained optimally through early intervention of a multidisciplinary team integrated by the surgeon which should include a physical medicine specialist (physiatrist), social worker, nurse, psychologist, occupational and physical therapists, and a vocational rehabilitation counselor.